UNITED NATIONS - UN Secretary-General Kofi Annan said Tuesday a negotiated settlement with Iran over its nuclear program should be sought, and he warned that military intervention would be "unwise and disastrous." Annan, who steps down as UN chief Dec. 31, issued the warning as the Security Council debated a resolution that would impose sanctions on Tehran for refusing to suspend uranium enrichment. The United States is considering sending a second aircraft carrier to Persian Gulf as a show of force against Iran. He addressed concerns about a possible military operation in Iran at a farewell news conference in response to a question about how the Security Council should deal with crises after the Iraq war. 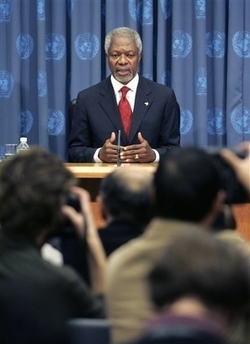 The council refused to authorize a war against Saddam Hussein in 2003 and Annan called the UN's failure to stop the conflict "the worst moment" of his 10 years as secretary-general. "You mentioned Iran, which implies that there is concern that there may be another military operation there," Annan told a reporter. "First of all, I don't think we are there yet, or we should go in that direction." "I think it would be rather unwise and disastrous," he said. "I believe that the council, which is discussing the issue, will proceed cautiously and try and do whatever it can to get a negotiated settlement for the sake of the region and for the sake of the world," he said. The Bush administration has repeatedly declined to rule out the use of force in Iran, although senior officials have also said their first choice is to rely on diplomacy. A senior US defense official said the idea of building up US Navy forces has been discussed for some time and one proposal is to send a second aircraft carrier to the region. The official, speaking on condition of anonymity because the idea has not been approved, said it's unclear when a decision will be made. Iranian President Mahmoud Ahmadinejad reiterated Tuesday that possible Security Council sanctions would not stop Iran from pursuing uranium enrichment, a technology that can be used to produce nuclear fuel for civilian purposes or fuel for a nuclear bomb. Annan expressed concern that because of Iran's nuclear program and the situation in Israel, which is widely believed to possess nuclear weapons, several governments in the Middle East have said recently they are going to explore facilities to produce nuclear energy.